FAREWELL TO FR. TRAVIS GABRIEL – 10TH RECTOR OF SPC. February 11, 2014. St. Peter’s College bade farewell to their 10th Rector, Rev. Fr. Travis Jude Gabriel in a fitting and well organized ceremony today (11th February 2014). The College was bedecked with flowers and flags and balloons of blue and white and gold for the occasion and one could feel that not only had there been meticulous planning gone into the organizing of this event, but also that those responsible had done it with love and affection for a Rector who had been a guide, leader and friend. 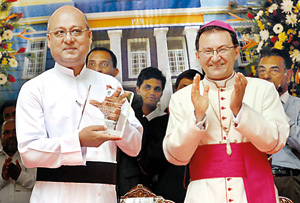 Having served as Rector for over eight and a half years from 2005 to 2014 and for another fourteen years in other different capacities, a total of twenty two and a half years (more than half his life as he mentioned at a different occasion), the College was bidding him farewell as he goes to lead another great Catholic institute of education. There were Bishops, . Drs. Emmanuel Fernando and Maxwell Silva of the Archdiocese, MSG. Renato Cuci representing the Papal Nuncio, Fr. Perera, a Past Rector, Mr. Nivard Cabraal, Governor of the Central Bank (a distinguished Old Boy and also a Past President of the OBU), Surgeon Rear Admiral Dr. Nicholas Jayasekera, President of the OBU among the special guests present, along with the community of priests and teachers of the College, Rev. Sisters, past Presidents and other senior office bearers of the OBU, many other distinguished old boys and family members of Fr. Gabriel, who graced the occasion. In addition to the many guests who attended, needless to say, the quadrangle was packed to capacity with students from the Collegiate Section of the school. At the scheduled time of 8.00 a.m. Fr. Gabriel was garlanded by 2 students as they welcomed him for the ceremony at the entrance to the quadrangle and escorted to the special dais by the College band, the Air Cadet Platoon of the College and the guests of . As is customary at St. Peter's for functions of this nature, as announced by the master of ceremonies, Mr. Bernard Jesudasn, the hoisting of the National, Catholic and College flags was the first item in the . Fr. Crispin Leo was then invited to lead the gathering in prayer after which the Air Cadet Platoon accorded Fr. Rector a ceremonial salute of . Mas. Pavan Palletenna, on behalf of the students and Ms. Abeyratne in a tearful speech on behalf of the teachers, thanked the Rector for all he had done for the College during his rectorship. The College Choir, which had received Fr. Rector's benevolent support, then expressed their gratitude in song with the Josh Groban "You Raise Me Up" in a fitting tribute to him. Bishop Emanuel Fernando in his address paid tribute to Fr. Gabriel for his excellent services to St. Peter's and also thanked him for accepting responsibility to serve another institute of learning in the Archdiocese, St. Joseph's. Next Ms. Kumari Karunaratne of the non-academic staff bade emotional farewell thanking Fr. Rector after which Mr. Anura Perera, Vice President of the PTA also thanked Fr. Gabriel on behalf of the PTA. After a song, specially composed for the occasion, was sung by the teachers, Mr. Suren Herath, President of the Welfare Society addressed the gathering. It is to be mentioned here that most speakers avoided listing of the Rectors achievements at College simply because they were too numerous to mention. It was the turn of the President of the OBU, Dr. Nicholas Jayasekera next and after his address a melodious Sinhala song of appreciation was sung by a student from the Oriental Choir. Fr. Travis then addressed those present and thanked the Lord Almighty for directing his life and giving him the opportunity to serve an institute like St. Peter's. Coincidentally, this day being the feast of Our Lady of Lourdes, he said that he had always felt that the Blessed Mother was with him at all times. His vision, he that St. Peter's should be a school of excellence and he believed that this had been achieved to a great extent. Addressing the students gathered for the occasion, he urged them to make use of the opportunity of being Peterites to become worthy citizens and emulate the example of many of the distinguished Old Peterites present. A standing ovation was accorded to Fr. Rector at the end of his speech which was followed by of sheaves of betel by students and presentations of mementos, souvenirs, albums, etc., by Mr. Seneviratne (a past President of the OBU who had also been a student of Fr. Gabriel), Fr. Silva, Fr. Sharm Dassanayake and Fr. Crispin Leo. At the conclusion of the presentations Mas. Yatagama, Head Prefect of College, proposed the vote of thanks. With the conclusion of the ceremony at the quadrangle, the guests were invited to the College Hall where Fr. Rector unveiled a portrait of himself as one among many other past Rectors who had rendered yeomen service to College to bring it to its present state from humble beginnings way back in 1922. A power point presentation by the students, of Fr. Rector's achievements at College brought the proceedings to a close.